Between rehearsals, not a minute was spared, as the ‘Be a Choristers’ and a number of volunteer choristers played team games, reflecting the collaborative nature of chorister life. 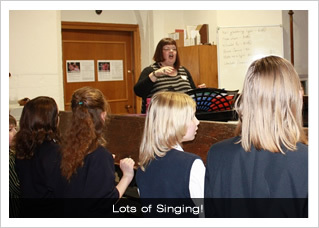 The mixed ages of the children was again not a problem, as each child performed the games and charades to the best of their ability, as a chorister – regardless of experience – always must. 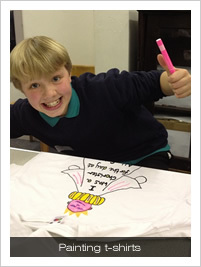 Every child then coloured in their own commemorative t-shirt, before consuming vast quantities of delicious home-made cake, biscuits and brownies! 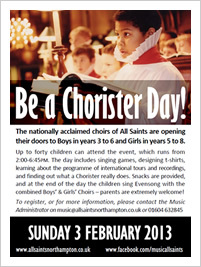 The ‘Be a Choristers’ then joined the Choirs, to prepare for Evensong. Marking Candlemas, Evensong began with a spine-tingling performance of Charles Wood’s great ‘Hail, Gladdening Light’, sung antiphonally across the two galleries by the Choirs. The canticles were sung to Ian Farrington’s ‘Blues’ Service, with its clear jazz, gospel and blues influences, and strikingly restrained 'Nunc Dimittis’. 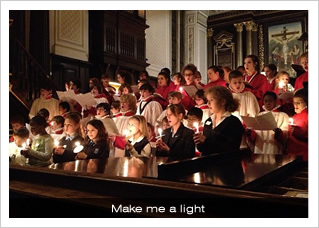 Finally all the junior singers came together on the chancel steps, each with a candle, to perform Philip Wilby’s gently moving ‘Make me a Light'. The choristers and the ‘Be a Choristers’ sung with great sweetness and professionalism, as though they’d been singing together for years. The service then proceeded into Benediction, as it does on the first Sunday of every month. A truly memorable end to a truly fantastic day.